The Canadian Rockies are the ideal place for a bucket list winter adventure. Feel like a true Canadian, as you experience dogsledding, snowmobiling, or snowshoeing. The snow falls deep here, as the mountains descend into the deep cold of the winter months. The scenery is breathtaking, so make sure to brush up on your photography skills! The winter is everything you’ve imagined…thick snow hanging from pine trees, frozen waterfalls, snow-covered mountain peaks, and a blanket of stars in the dark winter night. Whether you’re active and adventurous or are looking for a more relaxing pace, we’ve picked out the best activity options in each part of the parks – so you don’t miss a moment of fun. We’ll recommend the best gear to bring, so you can get out and experience the cold of a Canadian winter. Try freezing syrup on snow! Or take a selfie with frosty, white eyelashes. The cool Calgary air invigorates you as you start your Canadian winter train vacation. Meet your transfer at the Calgary Airport and ride in comfort as you enjoy the changing scenery through the Canadian Rockies. Spend the night in Banff, one of the liveliest mountain towns on your Canadian holiday. With plenty of quaint shops to visit, the delicious smell of homemade maple fudge from nearby sweet shops will lure you in for a truly delicious experience. Welcome to Banff, the mountain playground of the world! In the fall of 1883, three Canadian Pacific Railway construction workers discovered a cave containing hot springs on the eastern slopes of Alberta's Rocky Mountains. From that unexpected beginning was born Banff National Park, Canada's first national park and the third ever in the world. Enjoy the beauty of winter while you explore Johnston Canyon with the help of ice cleats. As you wander along the catwalks built into the canyon walls, enjoy the views into the gorge below. 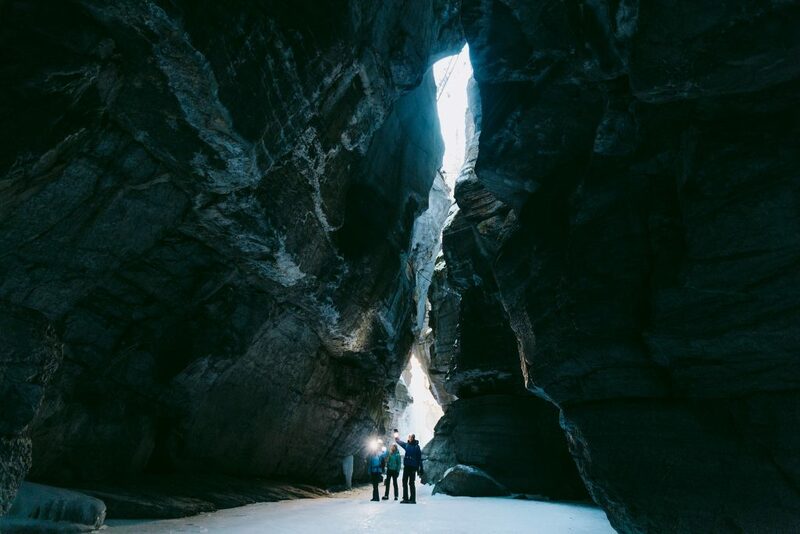 This popular ice walk will lead you past the lower falls and to the breathtaking upper icefalls. Travel through prime wildlife habitat and learn the clues to how Johnston Canyon was formed. Banff is an unforgettable destination for winter activities. Covered in a blanket of sparkling snow and ice, this makes Banff a perfect landscape for those bucket list activities you have been waiting to try: icewalks, dogsledding, skating, snowshoeing and skiing. And don't forget, there is always the Banff Hot Springs where you can warm up after a day of winter exploring. Sit back, relax and enjoy the scenery as your private driver and vehicle picks you up and transfers you in comfort from Banff to Jasper. Travel north from Banff, to experience a helicopter tour over the frozen Canadian Rockies. Land in the pristine wilderness for snowshoeing experience, then visit spetacular Abraham Lake, to photograph naturally occurring bubbles trapped in the ice. Afterwards, travel to Jasper with a private driver. Welcome to Jasper! Jasper is the gentle giant of the Rockies and this small mountain town offers visitors a more laid-back mountain experience with equal options for adventure, discovery and relaxation. Once seen as an island of civilization in a vast wilderness, Jasper has recently become a popular getaway from urban life, and a special place to reconnect with nature. Today you have a second chance to capture any pictures you may have missed on your journey up the Icefields Parkway. Sit back and enjoy the scenery as you head back to Calgary for the final night of your Canadian Rockies winter vacation. Fresh Tracks Canada customer service – from the time you book, you will have your own personal Vacation Coordinator whom you can reach out to with any questions or requests. Please confirm with your Vacation Advisor prior to booking your flights to ensure you coordinate with the transfer times available to and from the Calgary Airport. We had an amazing time. We did not want to come home, and in fact are thinking about moving over as we liked it so much! The Fairmont hotels we just unbelievable, we regretted not staying in more of them! They gave us free upgrades, champagne, chocolates and they were so helpful. There was a bit of a problem with a flat tire on the car, but it looks like they have under-charged us for the one way drop off fee by about $150 CAD so I wasn’t going to follow it up in case they figured it out. We will certainly pass on your details to anyone who is coming over, and we will be in touch if we can afford to come back for our anniversary. The Fairmont Palliser said they would give us a complementary Penthouse suite upgrade! Thanks again for all your help. The trip was absolutely wonderful – I’m in love with Banff and hope to return for a longer stay next time. It’s the most beautiful area in Canada I’ve seen – and being a tourist/arts town, everyone is very friendly and relaxed.